Although the possibility of this work trip had rambled on for a while, it was only with about two weeks’ notice that it was finally confirmed that, over the course of three weeks, I’d be in Mumbai (India), Kuala Lumpur (Malaysia), Jakarta (Indonesia) and, as stopovers on the way home, Hong Kong and Macau. Which, to be honest, was pretty damn exciting! The journey had been changing almost daily and, at one point, it looked like we’d be doing UK-Malaysia-Indonesia-Canada-USA-UK in 2 weeks with 51 hours of flying economy in between: quite literally a round-the-world trip! It would have been an interesting twist for this blog but not necessarily for my circadian clock. Anyway, with the short notice, it didn’t really give me much time to research proper runs (not that I could have postponed a work trip for this anyway) so I hastily emailed running clubs in all locations and got a few replies. 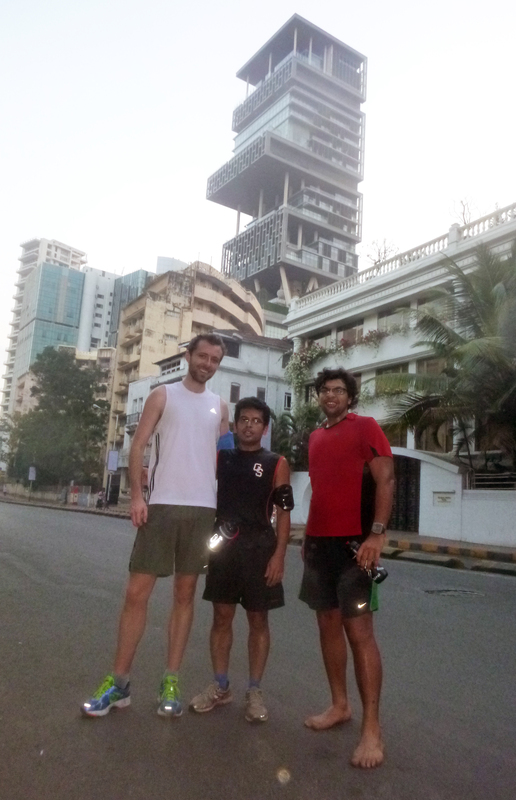 In Mumbai, my first of Phileas Fogg’s “real stopovers”, Ram and Beverley from the Mumbai Runners Club lived up to the fables of Indian hospitality and arranged via Facebook for 15 runners to meet up with me at 5.45am for a run through town. Much to my amazement, I was even accompanied by Passe-Partout on this run as my colleague Howard scraped himself out of bed to come with me! Outside a Hindu festival. I look like I have a goatee. Not a good look. 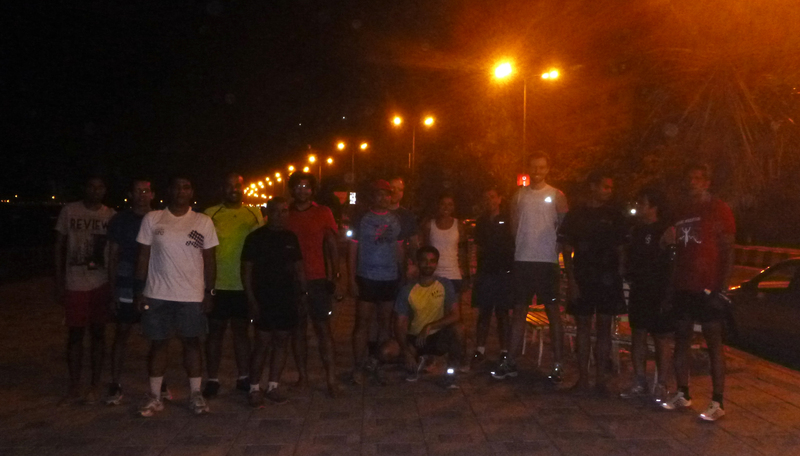 We met up on the Worli Sea Front, where there was a nice and empty, car-free, promenade. The last thing I was told before we left was “be careful, the cars will not stop for you” which I thought was a bit odd as there shouldn’t be cars on the pavement. 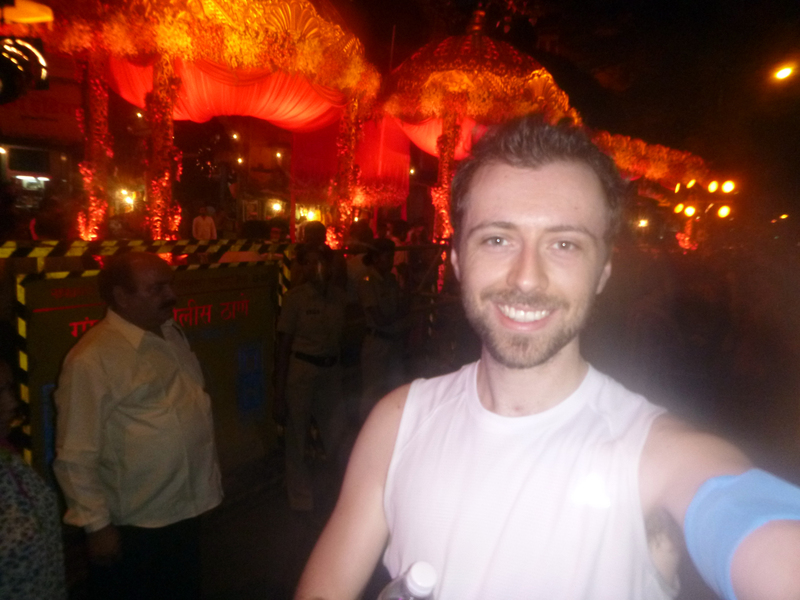 However, because it’s apparently easier to avoid cars than pedestrians, we ended up running along the road facing rickety taxis and other vehicles! Granted, it probably is easier to see cars coming but I’m pretty sure it’d be slightly less fatal to miss seeing a pedestrian! Over the next hour and a half, we went past a number of landmarks, including a ‘house’ now valued at $1billion! At 27 floors high, it seems a little ostentatious (and disgraceful) considering the millions of people living in slums nearby. It’s even worse when you consider that only 5 family members are rumoured to live in it alongside ~300 staff members. Anyway. As the sun started creeping over the horizon, the heat, humidity, traffic and population rose exponentially. 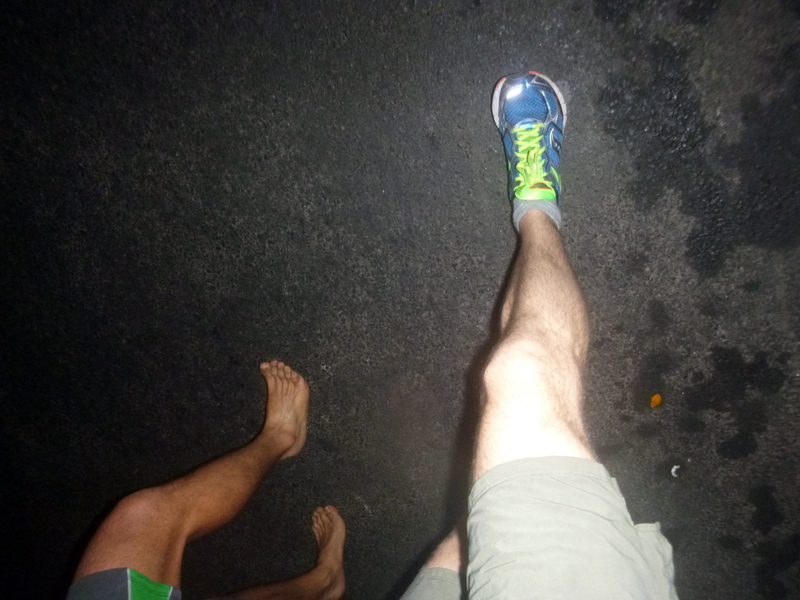 I still thought I was doing reasonably well considering the very un-Scottish conditions until I looked down at my feet and noticed that one of the other runners had been running barefoot for the whole time! It’s brave to do so in a perfectly clean stadium, it’s braver to do it in a decently clean town and it’s insanely brave to do so in Mumbai! Nonetheless, he made it home! Having split up into two groups, my group hobbled past a Hindu Festival, up the hill towards Kamala Nehru Park to see a few Jaiv temples, the Chief Minister’s house and a mixture of average looking houses which are, despite the widespread poverty, worth an absolute fortune, and back past the $1billion house and Mumbai’s race course. 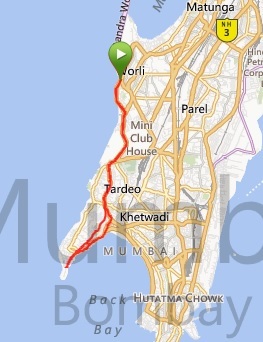 And, just as the bumper-to-bumper traffic was spreading through town and having even allowed myself a safe 100m sprint along the promenade, we ended our 16km (ish) off along the Arabian Sea at a gentle cadence in just over 1h15. All in all, Mumbai is manic (21 million people), rich, poor, new, old, modern, ancient clean and dirty but has, for the sake of using an over-used French cliché, a charming je-ne-sais-quoi! 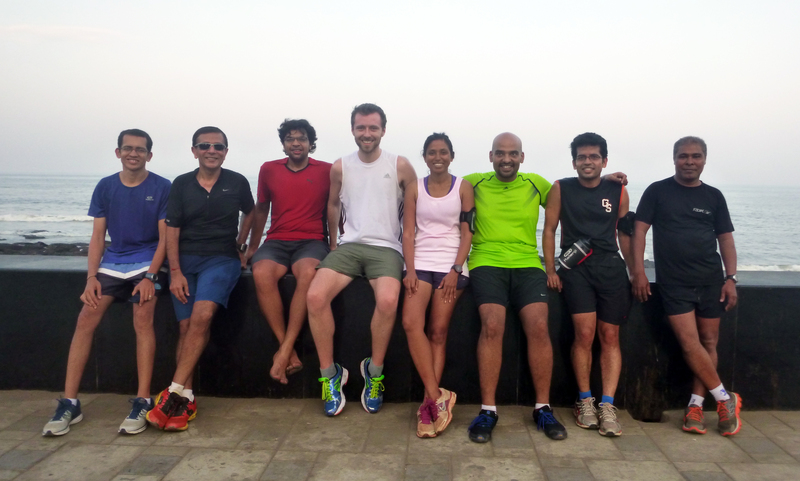 Without the Mumbai Runners Club, I wouldn’t have experienced 1/10th of what I did there – thanks again!